"These chairs were laid out for a wedding in 1939 in Poland. The wedding was abandoned, and so were the chairs due to the German invasion. They were found again after the war with the trees growing through them. Every year they are repainted." You might have seen this viral image floating around the web, and its definitely an interesting image to say the least. It really plays on our emotions of how sudden and tragic the Nazi invasion of Poland and other countries was, and how it so deeply affected so many families' way of life. Lives were put on hold and other lives were lost. However, like so many other viral images, this one joins the ranks of The Last House Standing, The Buckley Family Murder, and The Death Rose as very real images...but with very made-up back stories! 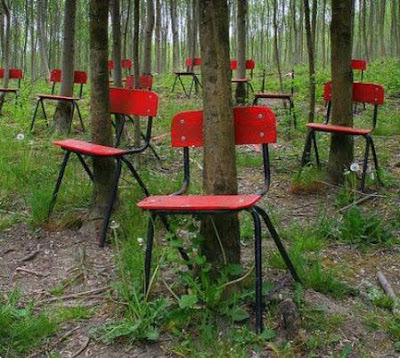 This image does not portray a testament to what is left behind after the people are gone, but rather is a statement of the artistic juxtaposition of trees (who are always standing) and seating. It is one of several similar art installations by Patrick Demazeau. This particular work from 2001 is entitled "The Four Seasons of Vivaldi" and can be found in Belgium.